Case of 12 English Standard Version Seek and Find Bible in hardback. Our case quantity price ($17.91 each) is 36% off the list price of $27.99. Published in partnership with Concordia Publishing House, this new full-color childrens Bible combines the complete ESV Bible text with more than 120 new, vibrant illustrations of major Bible stories. Accompanying each full-page illustration is the Bible story itself, clearly and accurately retold for young readersand for the parents, grandparents, and teachers who read to them. Each story includes a Key Bible Verse to memorize, Additional Readings for discovering more of the story throughout the Bible, and simple Reflection Questions to help children begin to understand and apply Gods Word. Colorful icons make it easy for young readers to see where each story is found in the Bible text and to locate the illustration that goes with it. 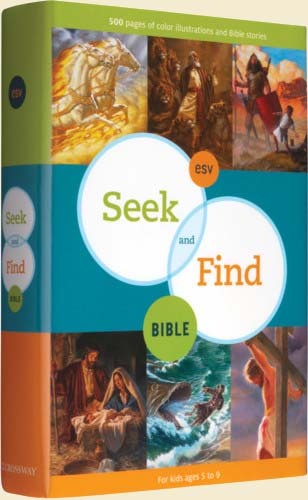 The ESV Seek and Find Bible is the ideal first real Bible for pre-readers and young readers, ages 5 to 9, to grow up with. It is also a wonderful resource for parents to use in family Bible reading and for teachers who teach the Bible to young children. Illustrated facts about Bible objects, structures, and places.